Oh, I forgot to tell you! Another Yoshitomo Nara painting called "too young to die". 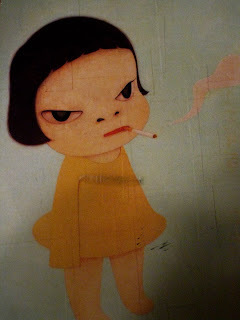 This pissy little girl reminds me a lot of the eight-year-old I saw smoking in Berlin, the one who I couldn't stop staring at because he seemed awfully young to be squinting through a plume of smoke and shooting me dirty looks. Then again, whatever. Life is complicated and that German third-grader just figured it out kinda early. I'm not actually surprised that this postcard sailed past the postal division of the Kentucky Values Board, assuming that there is one - not a safe assumption to make since it's just something that Halle and I made up on the phone one day - but no doubt they WOULD let this little smoker through, since Kentucky has a long history as a tobacco-growing state.